College Counselor Evelyn Alexander is passionate about helping students find their best-fit college. She brings a dedicated, student-centered approach to guiding students and families through the college search and college application process.Evelyn founded Magellan College Counseling in 2011 after spending 15 years as a volunteer alumni admissions recruiter for Johns Hopkins University. She expertly teaches students and parents what they need to know about college admissions, focusing on helping students find colleges that fit them academically, socially and emotionally. Evelyn became involved with the college admissions process through her leadership in the Johns Hopkins “Second Decade Society” of the Krieger School of Arts and Sciences. Evelyn co-chaired the Society’s Admissions Committee for seven years, and in that time, spearheaded an initiative to recruit underrepresented minority students to Johns Hopkins. She continued her work as a Johns Hopkins volunteer by appearing at college fairs, interviewing student applicants, visiting high schools, and training other alumni across the country to volunteer in these capacities. Evelyn doesn’t just help high school seniors get into college. In fact, she believes that the road to getting into a great college begins with college counseling for 9th, 10th, and 11th graders, too. Well-versed in the college admissions process at highly-selective colleges, Evelyn has given presentations with admissions officers from Hopkins and MIT at several national conferences for independent educational consultants. 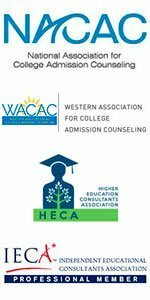 She maintains active memberships in college admission organizations including National Association for CollegeAdmission Counseling, Western Association for College Admission Counseling, Higher Education Consultants Association, Independent Educational Consultants Association (Professional member), and Counselor Advocacy for the Jewish University Experience. She’s also one of only 31 Certified Educational Planners in California – the highest designation for college advisors. Evelyn regularly presents webinars and workshops on college applications, extracurricular activities, and essay development for Magellan clients and the larger community. And because she is a recognized expert, she is frequently interviewed or asked to contribute articles offering college counseling advice. Before beginning her career as a college counselor, Evelyn managed political campaigns and public affairs projects. She holds a Bachelor’s degree from Johns Hopkins, a Master’s degree from George Washington University, and a Certificate in College Counseling (with distinction) from UCLA. A native of Los Angeles, she has held a private pilot’s license for over 20 years. She lives with her husband and two pit bull rescues in Topanga Canyon. Evelyn is proud that her work with Magellan College Counseling has resulted in so many college success stories, finding student success in college admissions extremely fulfilling.